Early start on Capitol Hill: Some of the events I attend on Capitol Hill begin so early that not even taking the first train from Virginia in the morning can get me there on time. If my last event the day before ends after 6:30 at night, there is no way for me to get home on the train. Driving is a nightmare, as the Interstate highways on the East Coast have not been updated much since they were constructed during the Eisenhower and Kennedy Administrations. A lot of I-95 is still just two lanes each way, except where States have shouldered the burden. Meanwhile the special transportation tax collected by the Federal government for highways is spent elsewhere. Some of the events, such as those below are important enough to get up before dawn to participate in. The National Day of Prayer: As the chairman of the Religious Freedom Coalition there are some events where my attendance is really required. The events surrounding the National Day of Prayer are just one example. My first event on the National Day of Prayer on May 5th was a meeting at 6:00 AM. More on that later. Two days before the National Day of Prayer on May 3rd a dinner was held in honor of Mrs. Shirley Dobson, wife of Dr. James Dobson. She has led the National Day of Prayer Task Force for 25 years. This year, 2016 was her last year as Chairman, and the leaders of many organizations were present to honor her as she handed over the reins of the organization to Anne Graham Lotz, Rev. Billy Graham’s daughter. This was an emotional event for many who have worked with and cooperated with Shirley Dobson on the National Day of Prayer for decades. The dinner, in the Ronald Reagan Building, lasted until 10:30 and included various speakers and award presentations. The next day, Wednesday, May 4th there were National Day of Prayer events beginning at 10:00 AM that included separate men’s and women’s prayer meetings. I could not attend these because there was an event centered on the Middle East, at which I had to be present. 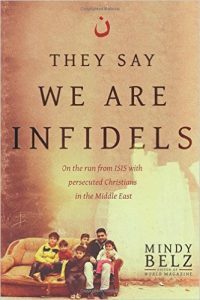 This was a noon presentation by Mindy Belz, editor of World Magazine on her new book, They Say We Are Infidels: On the Run from ISIS with Persecuted Christians in the Middle East. Mindy Belz presentation: It is extremely important for me to be present at events in Washington that highlight the Middle East and religious persecution, because those opposed to helping Christians, including Muslim activists are usually present. Muslims often show up at presentations on religious freedom issues in an attempt to dampen any critical talk about the oppression of Christians and other minorities in Muslim nations. Most often, at least one Muslim woman shows up in a hijab to let the speakers know there is a Muslim present taking notes and pictures. I have known Mindy Belz for many years and she is a fearless journalist who has defended religious freedom and reported on the persecution of Christians. In 2014 she filed a video blog report from Erbil, Iraq when the Islamic State fighters were less than five miles away. Artillery fire could be heard in the background. She and I correspond often and Mindy has reported in World Magazine about our Christmas for Refugees events. The events at the Heritage Foundation and Hudson Institute are video recorded and made available. I have in the past made presentations at both Heritage and Hudson myself. I always make sure to ask an author or panel member a question that will expose even further the plight of Christians in the Middle East. If I am unable to attend, then one of our freelance writers, normally Andrew Harrod, attends for me and writes a report. Back to the National Day of Prayer events: After the Mindy Belz presentation, I met with a congressman at the Capitol Hill Club, which is a members only conservative club about one hundred feet from the entrance to the Cannon House Office Building. Only Republican members of Congress and vetted conservatives can obtain membership. Decades ago, in order to become a member I had to have two members of the Capitol Hill Club, one a congressman, vouch for me. Otherwise I would not have been allowed to join. After two other meetings I was free to attend the National Day of Prayer Reception. This was an invitation only event at the J.W. Marriott Hotel three blocks from the White House on Pennsylvania Avenue. Our Washington office is also on Pennsylvania Avenue. The reception was in honor of the founder of the National Day of Prayer Task Force, Vonette Bright, the wife of Campus Crusade founder Bill Bright who died in December of last year. She had turned the organization over to Shirley Dobson twenty-five years ago. The evening event ended after 10:00 PM. The history of how the National Day of Prayer was and what is has become, is amazing. On the actual day each year, not only is there prayer in Washington, DC but in every state capital, and in many cities and towns as well as seventy other nations. Those praying in other nations are praying for God to guide the leaders of our nation. The National Day of Prayer: On Thursday, May 5th my first report time was 6:00 A.M. at the office of Faith and Action which is located in a townhome on 2nd Street just behind the Supreme Court. The office is easy to find because of two tablets with the Ten Commandments in the small front lawn. Rev. Rob Schenck is the founder and president of Faith and Action, and we have worked on projects together for years. 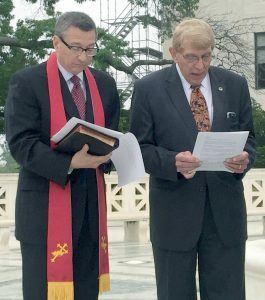 Each National Day of Prayer we gather a few pastors and leaders together to pray on the grounds of the Supreme Court. In the past, some people including my friend Rev. Patrick Mahoney, have been arrested for praying at the Supreme Court. It took many years of effort, but finally the Supreme Court marshalls were forced to agree that a small group of people praying together without holding any signs or banners was not a “demonstration.” In the past, those praying on Supreme Court grounds were arrested for holding a demonstration without a permit. The Supreme Court will not issue any demonstration permits, so any demonstrators with signs you may see pictured are actually on the public sidewalk in front of the Supreme Court. After gathering all of the pastors together we left the Faith and Action headquarters and walked to the front of the Supreme Court on 1st Street to gather and pray for the Justices of the Court, the Congress and the leaders of our nation, under the close watch of one of the Supreme Court guards. There, twelve of us read from a scripted booklet that had been prepared. I was the first to pray, and my prayer was for the nation. Others read prayers for the civil authorities, the President, the Congress, the individual Justices, etc. A copy of the booklet is delivered to the Supreme Court marshalls. It is not censored and is done just as a matter of keeping the peace and making them comfortable with us. At the Capitol: After our prayers at the Supreme Court we walked to the Cannon House Office Building where the annual event has been held for seven years under the sponsorship of my good friend, Congressman Robert Aderholt of Alabama. I sat near the front with Congressman Louie Gohmert of Texas. The well-organized event lasted until 12:30 as individuals from each group to be prayed for took to the podium to speak and lead the prayer. As an example a military chaplain led the prayer for the military. When the National Day of Prayer event ended, I returned to my office to work. This entire election year, Congress is out of session the first week of every month except September. The only congressmen left in the city were those who stayed specifically to attend the National Day of Prayer. Congressman Gohmert for example, was at every single event. Congress will also take off to campaign this year during the last two weeks of July and the entire month of August. The House will then meet all four weeks in September and then take off to campaign for their seats the entire month of October and the first week of November. More so than the Senators, the congressmen work seven days a week for about sixteen hours a day either trying to keep up with legislation, fund raising or campaigning. Most congressmen must work phone banks about four hours per day to raise funds for reelection. It is against the law to do this from their offices, so phone banks are set up at both the Republican and Democrat headquarters. While congressmen are in their home districts in July, I will travel to the Middle East to check on our Diapers for Refugees program and Camp Gilead for Christian youth in Jordan. Keep in mind that this activity was during a week that Congress was not in session. Normally I try to work from our Virginia office during out of session periods because most of our staff and logistic support is there. The Washington, DC office is used for staging appointments with congressmen and participating in events to promote religious freedom and the cause of persecuted Christians in the Middle East. During weeks Congress is in session, it can get even more hectic. Families must register in advance and are chosen by camp administrations based on need. 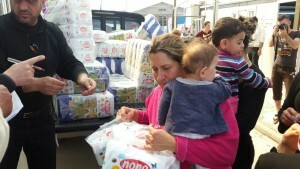 Diapers for Refugees: We have scheduled the next delivery of diapers in Iraq for June. Right now I can’t release the exact date, as we are still negotiating price and security issues with the supplier. Your prayers are needed. Prices are very volatile in a war time situation. Prices can vary a great deal just based on which roads are open. If a truck that normally takes a two-hour direct route has to travel five or six hours out of the way and have a guard on board, the price can change. If a warehouse cannot be restocked, that causes a change in price as well.